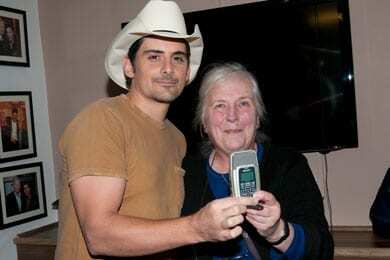 RTE broadcaster Sandy Harsch recently received good and bad news when Brad Paisley revealed to her that she had been named CMA International Broadcaster of the Year. The good news, of course, was the honor of being selected. The bad news was that the actual award was held up in customs and didn’t make it to the presentation backstage at Paisley’s show at the Olympia Theatre in Dublin, Ireland. Harsch moved to Ireland from the US in 1960, working as a freelance photo journalist and then as chief photographer, reviewer and interviewer for Hot Press magazine. She started in radio at RTE as a guest critic on “Outside Track,” before moving on to Century Radio in 1989. She rejoined RTE in 1996, and has been presenting “Country Time” ever since. Harsch also serves as editor for Lonesome Highway magazine.